Although population is strongly correlated with commuting time, particularly when all metro areas over population one million are included in the sample, the differences are surprisingly small. Orlando, with an urbanized area of only 600 square miles, has a mean commute just twelve seconds shorter than Dallas, which covers 1,780 square miles, although both cities have comparable densities, employment centralization and highway miles per capita. The conventional explanation for this phenomenon, as one 1997 study puts it, is that "individuals and firms mutually co-locate in response to congestion costs, and thus reshape those costs." Implicit in this "tradeoff" theory is that, for most people, commutes beyond a certain length of time are undesirable despite any other advantages that might be gained from the location (e.g. housing cost, school quality, taxation level, crime), or else we should see commute lengths increase at a faster rate relative to population. The data suggests that maximum mean travel time is somewhere slightly over 30 minutes, as indicated by the outlier example of New York, where most residents of the metro area apparently prefer to pay very high prices for housing rather than relocate to far cheaper, but more distant locales (such as Dutchess County or the northern Philadelphia suburbs). The 30-minute figure has been noticed before by transportation planners. What do these constraints suggest for the urban form of America's cities, if anything? 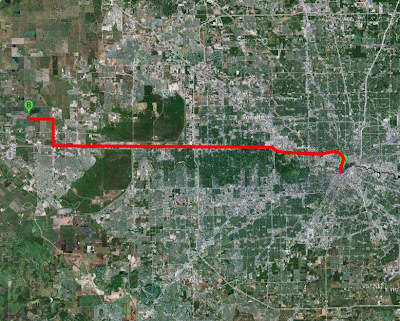 The map below shows the commute from a new residential development in Katy, Texas, to Houston's central business district, which is measured by Google maps at 44 minutes in optimal traffic conditions (Uptown Houston is only a slightly closer 39 minutes). At distances like this, with a diminishing number of potential purchasers willing to undertake such long commutes to major job centers, faster transit virtually out of the question, and any new edge city employment clusters unlikely to contribute a significant proportion of metro area jobs, one wonders how much longer outward urban expansion can continue at its current rate. "[A]t the metropolitan level, average density is principally a surrogate for city size. ... Thus densification, like polycentricity, is primarily a market response to contain or reduce otherwise high interaction costs found as cities increase in population ... rather than a cause of those travel times." This theory doesn't imply that outwards expansion will come to a screeching halt once some magical distance from the center is reached, but that the balance of new construction will attempt to shift to the core as commutes from fringe areas begin to significantly exceed 30 minutes. For those despairing of an end to suburban sprawl, this may provide a glimmer of hope. However, smaller cities with abundant land for expansion – for instance, Indianapolis, San Antonio or Oklahama City – ought to see comparatively less movement back toward the center, and that is reflected in the 2010 Census data (exceptions will certainly exist, though, due to other factors such as geography, demographics, transportation investments and city regulations). None of this is exactly earth-shattering stuff, but in terms of looking at big picture issues for long-term urban growth, the importance of time preferences shouldn't be overlooked. --Old but still relevant: Housing and the Journey to Work in U.S. Cities (Observing that the shift to auto commuting was a rational choice during the 1960-1990 period, and accounted for declines in average commuting times in spite of increasing commuting distances. However, as of 2010, average commutes are up in all major cities as compared to 1990, in many cases significantly, showing the diminishing returns of this strategy over time). --More spatial patterns: Traffic and Sprawl: When Jobs Suburbanize, Whither the Commute? (Echoing the finding that job decentralization is associated with shorter commutes, but observing that it cannot halt or reverse the trend of increasing average commutes as due to overall urban growth). Well, it's a mistake to think that the people who move to these exurban locations are primarily commuting into downtowns -- only a fraction of the jobs in any large metro area are there (maybe only 20 to 30%). I suspect most metropolitan-area workers are suburb-to-suburb commuters these days. In general, people seem to think it's weird when you actually live close to where you work, and I tend to think there's a societal pressure to live as far away as is practical. Perversely, as businesses migrated away from the central cities and into suburban zones in order to be closer to their workers, many people just decided to move farther out. Of course, it doesn't help that most suburban job "centers" are massively sprawling complexes themselves -- often taking up much larger tracts of land than downtown zones do, yet with far, far lower job density. Add in the problem of exclusive zoning, lack of a dense road/sidewalk network, and generally crappy layouts, and it's often physically impossible to live near work anyway -- why bother trying? Job locations aren't the only problem, either -- housing choices also get driven by school quality and access to shopping areas, which are often out in the suburbs too. Mike -- you're absolutely right that only a minority of commutes are made into the old downtown. Houston only has about nine percent of all metro area jobs in its central business district, and some cities have even less. That said, the secondary employment sites that have formed are not that far-flung from the center. Uptown Houston which I mentioned is only about six miles away from the downtown. The Medical Center area is barely four miles out. These so-called "edge cities" are very much at the center of things now. My guess, as I mentioned in the post, is that the emergence of large new employment clusters on the fringe is now less likely, since a company which chose to locate in such a place would gain less in access to labor than it would lose by putting itself out of range of much of the rest of the city, now that distances have become so great. In any event, at a distance of 30 miles from the center (where some of Houston's new housing is occurring, and which represents the distance between Dallas and Fort Worth), you really have a new city, not just an extension of Houston. A new peripheral business center might in time emerge, but it shouldn't alter the broader market forces pushing people back toward central areas, where the bulk of jobs are and will almost certainly remain. Hmm. I guess I spend a lot of time fixating on suburban job centers in the Twin Cities, some of which are 12-15 miles away from downtown Minneapolis. Eden Prairie southwest of the city is a prime example -- around 50,000 jobs there with many clustered in their so-called "Golden Triangle" full of tech companies, plus a big shopping complex a few miles farther out. A new alignment for U.S. 212 completed within the last five years has helped sprawl continue along the Minnesota River. The Twin Cities region is a bit unique, of course. I think that the two central cities of Minneapolis and Saint Paul give a false sense of distance -- the downtowns are 10 or 11 miles apart, though I think many people have always perceived them as being much closer together. Job clusters in 2nd- or 3rd-ring suburbs have probably been tolerated more here just because they seem to be at a balanced distance from the center of the region. I like your point about employers' access to workers, however -- if that gets properly considered when siting businesses, then there should be gravity pulling them back toward the center. Of course, looking at transit connectivity, a central site would be a no-brainer, but few companies seem to care about that. Unfortunately, a lot of businesses are just located in a place with cheap land and low property taxes which is convenient for the owner to get to. Minneapolis is an interesting case – the freeway network appears to me to be more naturally conducive to polycentrism than in some other cities. Rather than taking the form of a giant bullseye on the CBD, as in Houston, it has a gridded appearance with the downtown less a point of emphasis. For instance, there does not appear to be a direct route from Eden Prairie to the downtown – the express routes run only north and east. That puts it on a more even footing access-wise. I think overall city size is also important – with the Minneapolis-St. Paul metro population a little more than half of Houston's, it is still possible to make it from the residential neighborhoods north and east of the Minneapolis CBD to Eden Prairie in about 30 minutes (or so claims Google maps – I'm not familiar with Minneapolis traffic). The bulk of the city is still within a tolerable commuting range, which means a company can have its cake and eat it too (low land costs/high labor access). With a city of over six million, at comparable densities, following the population to the fringe will by contrast put a large chunk of the metro workforce out of mean commuting distance. I'm sure some businesses would be willing to take that deal nonetheless (retailers certainly won't mind), but it's a cost that an edge city in a much smaller metro does not have to bear. Toronto has a lot of jobs quite far from the center. Although the downtown has a fair bit of the metro's jobs (20%), the rest are mostly in lower density employment zones, often 15-25 miles from the core. These far out employment zones hold probably around 50% of the metro's jobs. Close to half of Toronto's 3 million suburbanites live in suburbs (Mississauga, Vaughan and Markham) that are pretty far out and have more jobs than workers. There are a few potential reasons I can think of for this. 1. The highway network does not favour downtown, with only one highway going through it (Gardiner/Don Valley Parkway). It is also grid-like, so other areas near downtown are not well served, often not served at all by highways. In fact, the area that's best served by highways is probably the huge employment area around Pearson Intl Airport, home to hundreds of thousands of jobs. The other major jobs centres listed above can also be accessed by at least one, often multiple highways (more than downtown). 2. Toronto has serious congestion issues that mean commutes during rush hour take close to twice as long as if there was no traffic. As a result, the area within a 30 minute car commute of downtown Toronto is quite small, home to maybe 1.5 million out of 5.5 million for the metro. As a result, I would say a majority of downtown workers take commuter train or the subway from suburban areas instead of driving. Areas in the central part of the city outside downtown don't have as good access to transit though, since the commuter rail system only serves downtown. Unless you live on a subway line, you would have to go downtown by commuter rail and then transfer onto subway or streetcar. Also, because of the congestion issues, a lot of people are reluctant to work in faraway suburbs, preferring to stick to their county or maybe closer parts of the neighbouring one. 3. The average residential neighbourhood near these far out employment areas has a density of around 10,000 ppsm, so there are a fair bit of people living nearby. This means these employment areas don't have that much fewer people within a 30 minute rush hour drive than central city employment clusters. Thanks, Nicolas, for all that information. Looked at from a city-wide view, the airport area does indeed seem to be the center of the highway network, and "downtown," with its location on the lake shore, appears position-wise like an edge city. Even with its now-peripheral location, though, downtown is still within about 15 miles of the rest of the city, with only a few areas more than 20. 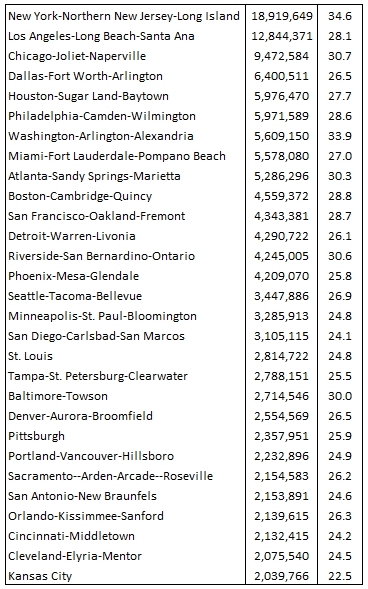 I guess this is due in part to the fact that Toronto is denser (using average density) than any other major city north of Mexico -- this list of urbanized areas on Wikipedia shows it to have a larger population than Houston, yet it occupies less than half the area! Also, with a city that was originally founded alongside a major body of water, a job center that moves away from the downtown may actually be moving toward the center of population, rather than away from it. While suburban job centers can't be ignored, I don't think that their influence is as big as it may seem. I tend to think that while they do encourage some farther-flung exurban residential growth, they're still limited by not being in the center of the region. Because people are scattered around a metro area for various reasons (schools, crime, a spouse's job, family, friends, etc.) a suburban business center that may be more convenient to people who live near there is decidedly less convenient for those who live on the opposite side of the metro. This is especially the case for those who would have to commute through downtown. This limits the pool of potential employees through geography alone, compounded because such suburban job centers don't have the same cachet as their downtown counterparts. Actually, development on the fringe can in fact come to a screeching halt. The key thing to remember is that the magic "30 minutes from work" is not just a function of the location of the home and workplace, but also of the transportation infrastructure linking the two, and in the case of roads, congestion is a major factor. Once the area hits that limit on outward growth and starts building infill, congestion in the center starts to increase accordingly, even faster than it would from outward growth, and even with no changes anywhere on the outer fringe, suddenly those places that were 30 minutes away are now 45 minutes away, so for the market for suburban housing, the dropoff in demand can be much more sudden than if you just assume some distribution that just declines with distance. That's also one reason why suburbanites are often so insistent on cities providing lots of automotive amenities: the city cutting down parking, or removing a freeway can effectively ruin the suburbanites' property values by putting them further away from the city (in terms of travel time or expense). Commute times tend to be shorter than we think they would be. This is because the kind of people who care about communting times, except for their own, tend to be highly educated upper middle class people -- in other words, people with specialized jobs commonly located in a city center, and who desire and can afford a big suburban house far away from the city center, and who can afford to commute 1hr or more each way. Most Americans work in generic sort of places: the auto repair shop, the Big Box store, the realty office, the public school, the local government, the hospital, that sort of thing. These sorts of jobs are typically within ten miles of the house. Nathan, that's a good point -- the power centers with their chain stores do willingly follow new developments out as far as they will go, since they draw on a localized customer base, and don't need to worry about casting the widest possible net for potential employees. The same will go for the local doctor, dentist and schoolteacher, although hospitals are often more centrally located -- many of the large medical research clusters that I am aware of are fairly centralized, as are their associated universities. The fact that the specialized jobs are disproportionately located in the old downtown does suggest an income component to population re-centralization, since the highest-income groups will have the greatest incentive to relocate toward central areas (as their commutes are among the longest, and their job options are the most geographically-centralized). I do not completely disagree with your final analysis, but I do think one thing should be pointed out. There exists a large number of jobs along Beltway 8 (BW8) between US59 and IH10 and then along the spokes around the intersection of BW8 and IH10. This area is hard to recognize as an employment center due to its autocentric nature, but it does represent a huge concentration/number of jobs within the 30 min commute of the development under discussion. Thanks, awp, that's a fair point. Intersections between interstates and other major routes will still draw business concentrations, particularly along I-10 which looks like a monster of a road. Still, I notice that the intersection you describe (BW8 and IH10) is the location of the so-called "CityCentre" project, which apparently "is marketed towards people desiring to live in the city without having to travel far for food or the office." Nathan's comments are spot on - most jobs are extremely local. And don't forget, most companies are actually sole proprietorship's, and many of those are service oriented where you go to the customer (so commute time = 0). Next, you have to factor in remote work options for the high tech sector. Also, some cities don't have the specialized jobs downtown. Raleigh is a great example of that, and why that's a good thing. Research Triangle Park is right alongside interstate access and centrally located between cities, to allow for specialists to live away from downtown. Another reason it's always in the Top 10 places to live of course. The thing that's getting overlooked is commutes between things the government apparently thinks are different MSAs but in the real world are the same metro area - everyone who commutes from San Jose to San Francisco, or Baltimore to Washington, or Boulder to Denver (!) is getting artificially dropped from this sample, and they are legion! And by definition, those between-MSA commutes are going to be longer commutes. The booming "Energy Corridor" of Houston, full of energy companies, is focused near the intersection of Eldridge and I10, just outside Beltway 8. There are also many companies along a long stretch of Beltway 8 from 59 up to 290 and beyond around to 45N. People who live where you describe are most likely commuting to these jobs, not downtown Houston, which is less than 7% of metro jobs. H-GAC forecasts predict most of the job growth over the next couple of decades to be in these edge city job centers plus the Texas medical center (in the core). Downtown and Uptown are not expected to grow too much. The Woodlands and Sugar Land are also booming as job centers. The Woodlands just attracted Exxon's mega-campus consolidation. I suspect the future of Houston, and many other metros, is an outer beltway ring of employers with their family employees living farther out (bigger newer cheaper houses and better school districts) and their young singles living in the core and reverse commuting. All that said, I agree with your core thesis about the limit of commute times. In fact, one of the main themes of my blog, Houston Strategies, is the irony that cities that refuse to invest in freeway and other transportation infrastructure actually *increase* sprawl. When commutes get bad, employees rarely move to the core. Instead, employers follow their employees to the good suburbs and school districts. Then employees feel free to move another half hour out beyond *that*. On the other hand, strong transportation infrastructure investments keep employers in the core, and effectively limit employees to about a half-hour out, thus (somewhat) containing sprawl. Apartment developers seem to be banking on climbing rental rates while Houston residents embrace suburban living, which seems to be a sweet spot for cheaper housing and better school districts.